Last year my son built a birdhouse in his first year of woodworking in junior high. I was so proud I painted a cute garden scene on the front and we put it on a fencepost in the backyard. Before long I identified the male wren bringing sticks to the house and singing happily. We were all excited when he called in a mate and she began to bring grasses and fluff to the house. Before long we saw the male bringing her food while she sat. The wrens didn't seem to mind us in the yard even sitting in chairs nearby. Before long though, a sparrow began sitting on the perch and blocking the male wren from feeding the female. I tried repeatedly to drive away the sparrow and even resorted to "guarding" the house every time I was out by spraying the sparrow with the hose. Unfortunately we stopped seeing the wrens and later discovered all their eggs unhatched in the nest. This year when nesting began the wrens returned and as soon as the male began bringing sticks the same male sparrow returned and sat blocking the nest. We removed the perch after some research and thought that was the end of the problem but the male sparrow began sitting in the tree and wouldn't leave even though we saw and heard the male wren vigorously trying to drive him away. My husband commented that he saw quite a squabble going on on the ground near the birdhouse but we assumed it was mating or fighting sparrows. Later that day we were shocked and saddened to find the house wren on the ground dead under his house. While we had originally read that the hole should be no more than 1 and a quarter wide we now have found it can be 1 and an eighth and are trying a board with a new smaller hole over the opening because the sparrow was able to get in the 1 and a fourth and we saw him coming and going from the plundered house. With the new smaller opening the sparrow can't get in even though he started trying as soon as my husband finished nailing it on. Hopefully this will make him go away, otherwise we may take harsher measures since the sparrow is a nuisance and now an obvious killer of the natural species. I didn't know prior to this that they were so nasty, but have learned from reading online that sparrows are to be discouraged and are an invasive destructive species that not only take the food supply of other birds but also kill and take over nesting sights. Had a house wren build a nest inside my garage, and saw the male coming in and out. As I was going away, I left the garage door partially open; and put some water out. Upon returning, I found the female still on the nest, but have not seen the male since returning. I'm so glad I found what you wrote because last year Myron's all the babies were dead outside of the box on the ground I started crying so I buried them all and then the mom came back looking and looking it was so sad I have learned a lot by reading all these sad stories I'm going to be more aware of the size of the hole going into the bird houses right now I have runs in an actual run house so no terrible sparrows can get at them it was the saddest sight seeing all those little birds dead I could not believe it thank you. Ok...the European House Sparrow or English Sparrow is actually a Finch or Weaver. Please don't confuse it with native sparrows! European Sparrows here in America should be killed at any chance. They have no purpose in America's ecosystem...period! As sad as the main article and comments are, it's good for people to know this information. But it brings me to wonder about certain big box stores with large, open garden departments where sometimes hundreds of House Sparrows live, breed/nest. There are a ton of those birds living in nearly every single one of them too, as well as the roofs of gas stations, etc. While a part of me feels sorry for those birds, since it wasn't their choice to end up here, I know we must protect our native species. I truly wish there were a simple, definitive solution to this problem. We've not put out any nesting boxes due to the fear that the House Sparrows and/or House Wrens (known for destroying nests and killing babies as well) will find our boxes and hurt (or worse) the birds nesting there. Do both wren parents stick around to feed the growing chics in a bird house? We had a happy pair of parents but one flew into our house. We were able to get him/her out alive but we only see one parent now feeding the babies. We have searched the property to see if one parent died but no evidence. I am now worrying we have a single parent doing a lot of heaving lifting. Yesterday June 15, I heard commotion outside by a birdhouse that usually has house wrens nesting. A sparrow was blocking the opening and both parents were dive bombing it to try to drive it off. I haven't seen the sparrow this morning but plan to watch for it and drive it off if I see it. I love my little wrens and the happy song they have! Luckily, the sparrow was too big to get into the opening, but it was still able to block it. We are having same issue. We hung a cute "Cubs" birdhouse under the overhang on our front porch and were so happy to discover a pair of house wrens building in it. We're pretty sure the female has laid her eggs and this morning we noticed a sparrow chasing her into the house and continually attempting to get inside. So far he hasn't been able to but I'm worried the sparrow will hurt or kill the wrens. I didn't realize sparrows were so aggressive. I have watched Blue Jays devour others . I have watched blackbirds be pretty darn nasty to others also , to put it mildly . However, yesterday was the first time I had seen sparrows act this way . What makes them tick , I wonder ? We have old gourds hanging . Chickadees love one of them close to side porch . Hopefully they're safe from The Sparrows another gourd hanging in the Rose Arbor has wrens in it . I have adapted the whole , since it was about two and a quarter inches around , with a piece of another gourd with a 1 1/8 inch diameter hole last night . The smaller of the two wrens came back & checked out .It was in and out . Hopefully this will help them fend-off , "THE SPARROWS! " Sparrows, House Sparrows, that is what will kill Wren hatchlings if given the chance. The easiest way to keep them out is to put a 1 1/8 washer on the hole of the house. The sparrow will literally break his neck trying to get in. I have honestly seen this happen. Had to pull the dead sparrow out of the opening, but he didn't get my little Wrens!! I build about 10 houses a year and give them to my friends. It helps to grow the species. Btw, I have Bluebirds and Wrens in my yard and see no confrontations between them. Perhaps it's because they have plenty of nesting boxes. The sparrows are ruining my bluebirds! I've now lost two hatchlings of bluebirds to sparrows. Ordered my trap today. War on sparrows!! Eliminate the HOSP for the good of all native birds. The only way to help native birds are to eliminate the house sparrow, not just deter their actions. They must be killed or they will just move on and kill other native birds elsewhere. I have had them to kill my Blue Birds and I have decided if they come around that I will not allow them to do this again. I bought live bird house traps and live repeating traps or will use my pellet gun or 22 if I can. I haven't seen a HOSP for two years now. We just moved in and found the birds were making nest in our deck rafters. There grasses kept falling out so hubby put in a side wall to help them out. They have been busy flying in and out making their nest and we just let them do their own thing. We did not know the eggs had hatched. Today we heard a tremendous scwabble going on and walked out to find 3 little babies dead on the deck with holes poked in their little heads. Mama and papa were perched off to the side watching the mess. Those babies never had a chance. Now hubby made a full wall with a one inch hole. Hopefully the next ones will make it. I will be on guard!. I had a pair of house wrens make a nest in my bird house this year as they did last year. However, the results were not the same. Last year the wrens were successful in raising their young. This year one morning I went out to find 4 baby wrens, about 1 week old with pin feathers just starting, dead scattered around under where the house is. I had no idea why this happened. I couldn't imagine them jumping from the house as they seemed to small with eyes still closed to find their way out and with what motivation? I was just perplexed as it did look like a murder scene with two on the ground and 2 on top of each other in the crotch of the tree. I was so sad and it seemed so quiet without the loud calling of the parent birds. I decided to look up the possible causes of what happened and low and behold I found this site which pins it on the house sparrows. 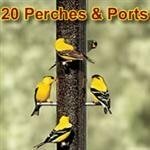 I do have many around and I have seen them peck holes in my drivit siding. I'm sure this is what happened to the little wrens. I took down the bird house and will now make the hole smaller so the sparrows cannot enter. My question is will wrens raise more than one brood a year? Might they come back or could I get another pair? Just a sad ending to what was so fun to observe and hear every day. I don't believe that Song sparrows nest in cavities. They are native birds and have a sweet, although not varied, song. They are not invasive and I have found them to be pleasant neighbors. The Wren's have fledged their babies and are now gone. After watching and listening to them closely, I found that they were Carolina Wrens with their 'Cheerily" song. We now have a song sparrow singing up a storm on our fence post all day. I think he has a nest in the shrubs in the next yard. I haven't seen many of the dreaded house sparrows, but think I can hear them. Trying to learn a loud of the bird calls I hear! Does anyone know, since song sparrows are not cavity nesters, if they are as much as a threat to the bluebirds as the house sparrows! The song sparrow stands on top of the house to sing, but is not interested in it at all. Also, should I remove the old Wren nest from the other box? Do they re-use them? Thanks for the help! Jennifer, thank you for your comments. My husband and I obtain great bird watching in our yard. 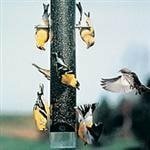 We have numerous species of birds coming to our feeders and nesting places and, as we live out in the peace and quiet in the middle of the country, the birds are accustomed to us being around and aren't afraid of us. We have watched over 20 house finch eggs hatch this year. We were just looking out the window and I said to my husband, "Look at the little sparrow trying to mate with the finch!" It didn't take long to realize that the nasty little sparrow was KILLING the female finch! I ran outside and brought the finch inside the house. I am quite sure she will not make it. We had NO idea that sparrows would do this! We've never seen this behavior in them. Thanks for letting everyone know that this is normal behavior for a sparrow. This is the invasive imported common House Sparrow. Our native sparrows do not cause any problems with any of our native species. It's legal to eliminate the House Sparrow (really a weaver finch)in the US. This species nearly wiped out the Bluebird. European Starlings also fall into the same category as the House Sparrow and are not protected species. Last year we had a sparrow drag all of the baby wrens out of our fine crafted birdhouse. My daughter and I carefully gathered them and placed them back in the house. I drove over to my friends house whose husband made the wren house for me. I had seen he had a wren house with a large washer surrounding the entrance hole and asked him if I could purchase one for an emergency replacement. I took it home, placed the babies in it and the wren family survived because the aggressive nasty sparrow could no longer enter the house!!! The washer prevents the sparrow from picking a larger hole with his beak!!! Try it, you'll love it! Now if I could figure out how to keep the dummy from sticking his head in the hole a million times a day because he thinks he's going to magically fit in there! A pair of House Wrens tunneled into a hanging basket of asparagus fern. They've done this several years in a row even though something keeps plundering their nest as soon as the little eggs have hatched. This year, we climbed up on a ladder and saw five little fuzzy heads. We thought the wrens had won at last but while I was away from the house most of the day, something plundered the nest and there is no sign of feathers or blood - just an empty nest and no wrens. We seem to see fewer birds of any kind as years go on. Drought may play a part in depleting the food supply but what can we do to stop this war? I understand using a house with a small opening may do the job. Any other input? 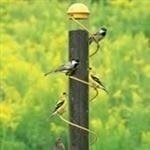 I found this site researching whether house sparrows would attack Wrens. Sadly I found they will. We put up a bluebird box and finally had a couple nesting. I saw a sparrow fluttering around the box and was so upset to find a bluebird inside all beat up! I took her to a rescue facility, but she didn't survive. Now we have the box hanging open so no bird can nest in it until we figure out what to do about the sparrows. So frustrating to see the bluebirds returning to nest again, and we can't let them for fear they'll be killed! We have a wren in the other box in our yard. I haven't seen any sparrows harassing them. I would hate to see them killed too. Oh, I also found a chickadee dead in the bluebird box. Another reason we left the door open. A pellet gun sounds good about now. While they appear similar to the untrained eye, there is a world of difference between the House Wren and the lovely Carolina Wren. The House Wren is a mean killer that will peck holes in other birds' eggs, build a rough false nest of twigs in vacant birdhouses, and even kill baby birds of other species. I'm sure that's the reason the cheery Carolina Wren has been driven to nest so near to humans. I have one about 1 foot above my head as I traverse my porch walkway. The young are due to hatch this weekend. Meanwhile the noisy House Wrens are trying to find another place to lay their eggs after being kicked out of 2 boxes already. They take off for Florida when it gets cold. Then as Spring comes again they will arrive and chase away or kill the Chickadees, Bluebirds, Nuthatches and others. They are getting to be a real nuisance in Northeast Tennessee. Unfortunately it is illegal to kill these native birds. The Carolina Wren spends the entire year with us. I understand they will die from the cold rather than leave. They are so bright and cheerful in their song, and their brisk little head-bobbing habit is a joy to watch. Please learn to tell the difference between these two birds, and let the sparrows run off the brutal House Wrens. The white stripe above the eye is a sure mark of the Carolina Wren. The House Wren is a drab medium brown all over and their call is a nervous chattering sound while the Carolina Wren sings a "cheerily,cheerily,cheerily". Actually the House Sparrow is everything you just said about the House Wren which I don't disagree with but I would never endorse letting a House Sparrow nest anywhere. House Sparrows were introduced into this country and our native species have not evolved defenses against it. It's legal to destroy them and their nest. Because of them and habitat loss, we nearly lost our native Bluebirds. We encourage trapping House Sparrows. If you live in rural areas where it's legal we suggest shooting also. Some may find this harsh until you see a female bluebird pecked to death underneath the House Sparrow and her brood. I felt the need to reply to this comment only because of the endorsement of letting House Sparrows breed. House Wrens are protected species. You can remove nesting material as long as no eggs or young are in the nest. I could just scream!!! Finally, we got a wren to build in our new birdhouse this year. Got to watch them build the nest, frequent our flower gardens for insects, singing continually around the yard, picture perfect setting outside our kitchen window. A robin built a nest approx 12 ft above the house in the same tree and two days ago I watched it with the wren chase a male sparrow away. Basically, just to good to be true how it all seemed to working out. Then....2 days, no wren or singing. So sorry to hear about your wren. I am so glad I came across this website because I was running into a similar problem. We put up a wren house and they began nesting in it, then we saw house sparrows trying to take over, so I just now removed the bird food altogether. At first I tried to put out safflower seeds since I heard that the sparrows don't like them. 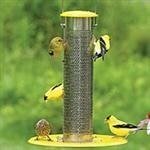 Well, we found that they will eat anything when they are desperate enough, so removing the feeder was the next best step. We feel sorry for the woodpeckers and titmice looking for food now, but we don't want the wrens to be killed. House Sparrows (Weaver Finches) are a threat to many native species. They will attack and kill adults/babies/eggs of desirable native species for no other reason than just being destructive. We observe them attacking and harassing the bluebirds and tree swallows that nest in our boxes. House Sparrows (HOSP) are not a protected species; and as such I would gladly kill any males I could catch; however, they are also very "street smart" and are exceptionally adept at avoiding any trapping measures I have tried. Conscientious bird lovers need to stop supporting the spread of this destructive bird by not feeding inexpensive bird food (anything with cracked corn or millet) and by diligently checking their boxes to make sure that sparrows are not reproducing in any of their boxes. I was sad to hear this-no doubt the little wren put up quite a fight. We have never had a problem with the sparrows harassing the wrens & we have lots of sparrows. I will be keeping an eye out for the sparrows that may want to hurt or kill our little wrens. OMG what a sad story. I felt just terrible reading about the little Wren family. I had no idea that sparrows were aggressive and would harm other birds including their nests. I hope your fix works for you.